63-year-old man presents with 9-month history of Bowen’s disease of right anterior and posterior sideburn biopsied on 08-20-18. History of previous Mohs excision of Bowen’s disease of the same area in February 2016. Patient has a history of multiple basal cell carcinomas, squamous cell carcinomas, and melanoma. Fig. 1. Closure of the Mohs defect in 2016 from recurrent Bowen’s disease of left temple. Red outline – biopsy sites. 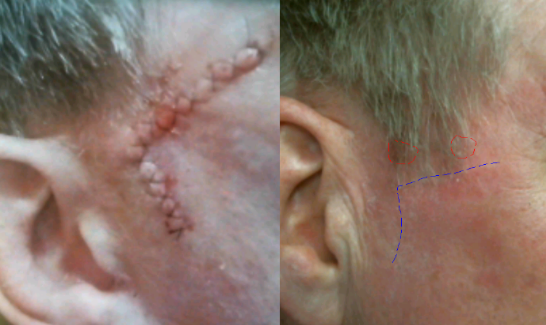 Blue lines – old closure scar. Management of this lesion is best treated with a topical agent such as 5-fluorouracil or imiquimod. Given the indistinct margins and previous surgical treatment, this lesion can be characterized as “field cancerization”. This implies a diffuse carcinogenic injury due to UV or other carcinogens. As such, the clinically visible lesion represents a portion of the damaged area. 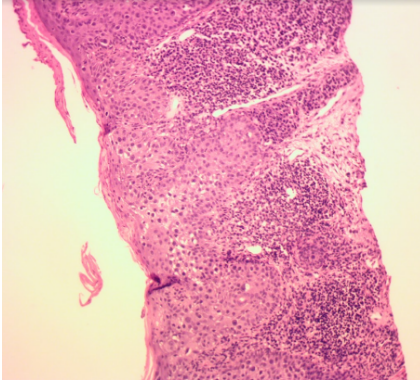 Histologically, atypical cells taper off from obviously involved margins. These cells outside of the surgical margins are at high risk of progression into clinically obvious lesions and invasive cancers. Thus, surgical management of in situ lesions in areas of “field cancerization” is not as effective as topical management. The choice for topical therapy is 5-fluorouracil (5-FU), a chemotherapeutic agent, or imiquimod, an immune response stimulant. Both are effective for Bowen’s disease, although for larger areas of treatment, 5-FU carries less toxicity than imiquimod. Photodynamic therapy (PDT) is also an effective treatment for a larger field as this. Some studies had shown PDT to be more effective with fewer adverse outcomes than topical creams. Curettage or cryotherapy can be equally effective, albeit with worse cosmetic outcome and in some case prolonged healing. Fig. 2. Bowen’s disease in shave biopsy.